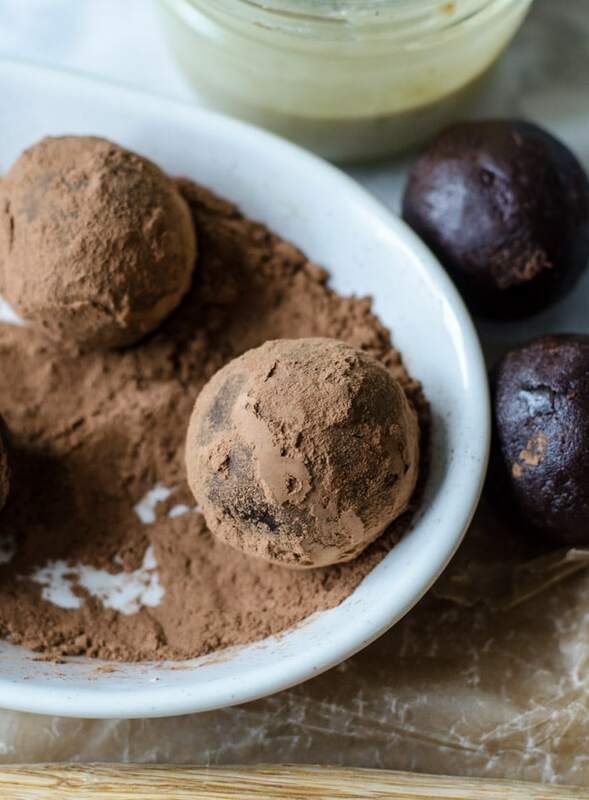 Tahini Cacao Fudge Balls with Sea Salt | just 3 ingredients! 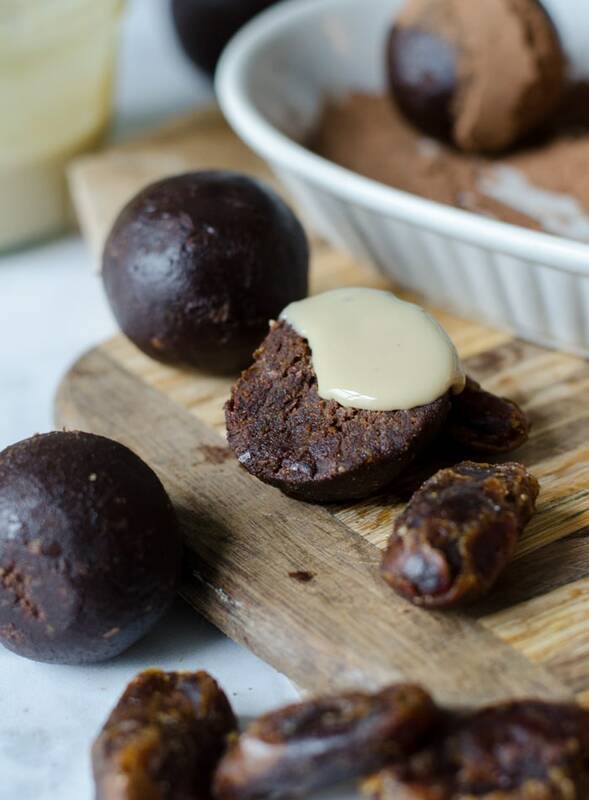 These salted tahini cacao fudge balls require just 3 simple ingredients: tahini, dates and cacao. And sea salt but we’re not counting that as an ingredient as it’s optional but highly recommended for that salted brownie flavour. 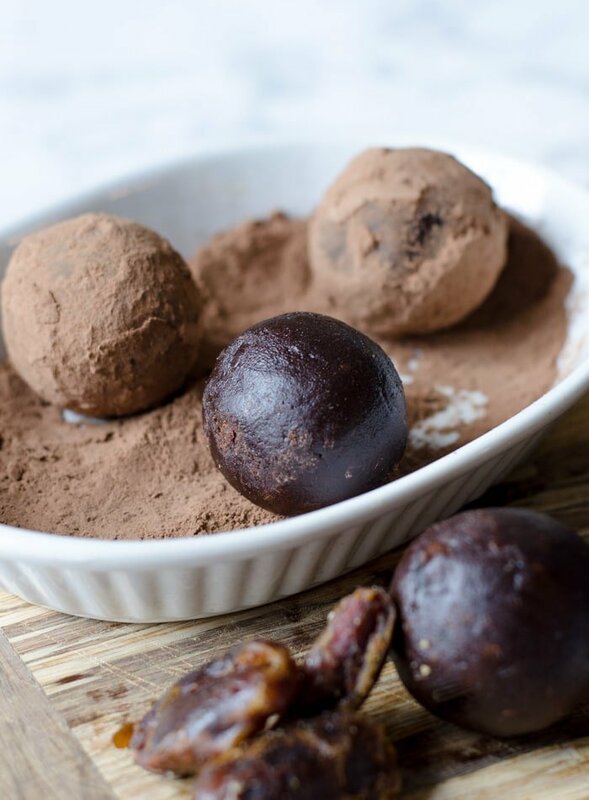 These balls are rich, decadent and fudgy but with those 3 healthy ingredients you can go ahead and eat them for a snack anytime you feel like it. 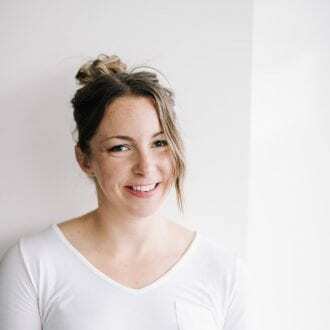 I’ve talked a lot about cacao on the blog before and it remains one of my favourite ingredients. Organic, raw cacao is a true superfood and is loaded with flavonoids, fibre and phytonutrients, such as sulfur, magnesium and phenylethylamine. 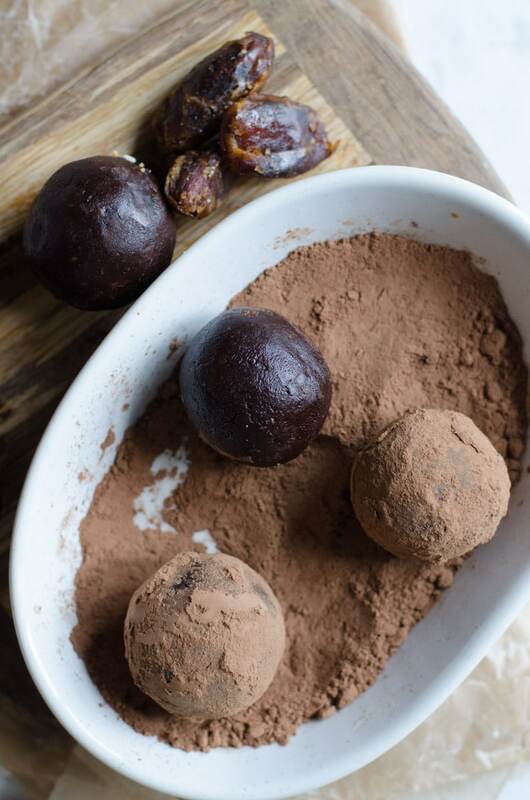 Cacao is a feel-good food thanks to it’s tryptophan content, plus it can improve focus and energy and it has more antioxidants than tea, wine and blueberries. Cacao powder. Just like regular processed cocoa powder but loaded with antioxidants, magnesium and other minerals. Can be used interchangeably with cocoa powder in recipes. I find it’s slightly more bitter than processed cacao but I love the rich, chocolate flavour and you can’t beat the it’s nutritional benefits. Cacao nibs. I eat cacao nibs or cacao beans almost every day, they’re one of my favourite ways to get a sugar-free, nutrient-rich chocolate fix. Cacao nibs are cacao beans that have been roasted, separated from their husks and broken into smaller pieces. They’re extra crunchy and are amazing added to smoothies, oats, baking, raw food recipes and even eaten on their own. Cacao beans. The cacao bean is the dried seed of theobroma cacao. Cacao beans aren’t used as common as cacao nibs but I usually keep a package of beans in my pantry for various uses however, I do prefer cacao nibs to cacao beans. Cacao beans are slightly larger than an almond and can be added to recipes, smoothies, blended or eaten as is, although they’re quite bitter so can take some getting used to. Cacao butter. Cacao butter is one of the richest, most beautiful and nourishing ingredients around. It’s a pure, stable fat, whitish in colour, that’s pressed out of cacao beans. Cacao butter can be used to make chocolate or skin care products such as moisturizer or lip balm, and is delicious dded to smoothies or blended coffee drinks. This recipe calls for raw cacao powder but you could also add some cacao nibs for some crunch. 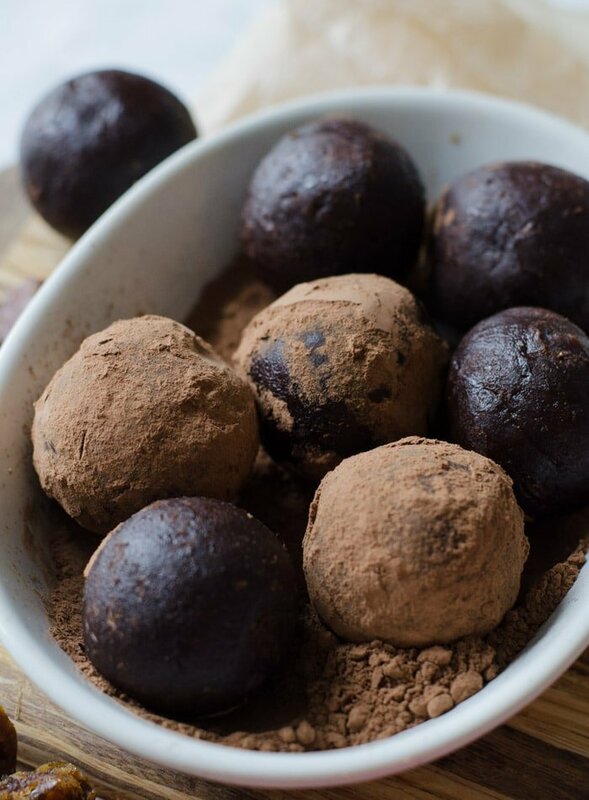 If you don’t have cacao or would prefer, you can use regular cocoa powder, which will provide the same flavour and texture but won’t offer the same nutritional benefits. Lately I’ve been using sayer dates for these kinds of recipes but medjool, deglect noor or honey dates would all work well. Sayer dates are really sweet and caramelly so they work really well to naturally sweeten no-bake recipes like this. As long as your dates are soft and moist, they’ll work well. If you only have dry dates, you’ll need to soak them in boiled water for 15 minutes before using. I’d highly recommend using soft, fresh dates for best results but soaking first will work in a pinch. After soaking, just drain them and use as is in the recipe. If they’re too wet, you may need to add a little extra cacao to balance the added moisture. Unless I’m buying medjool dates, I usually buy pitted dates since they’re so easy to use in recipes. Medjool dates are big and beautiful and amazing and I either buy a large container of Natural Delight Medjool Dates or buy them in bulk from my local natural food store, both of which come with the pits in. They’re also a little more expensive so if I need quite a few dates for a recipe, I’ll usually go for a less expensive option like sayer or deglect noor. Like I said though, any kind of date will work in this recipe as long as they’re nice and gooey and soft. The flavour, the fudginess, the texture, the sweet and salty combo…you guys are going to love these! Bonus: they taste like a decadent dessert but they’re totally healthy enough to enjoy anytime you want. For extra flavour and fanciness factor, you can roll them in more cacao, shredded coconut, finely chopped nuts or coconut sugar. I rolled my dough into 15 balls which worked out to 145 calories per ball with 22 grams of carbs, 5 grams of fat and 3 grams of protein. Each ball also contains 4 grams of fibre and 10% of your daily iron. They’re vegan, gluten-free, oil-free, refined sugar-free and grain-free. I rolled mine on the large size, you could probably get around 18 smaller balls if you want to reduce the calories for each ball. 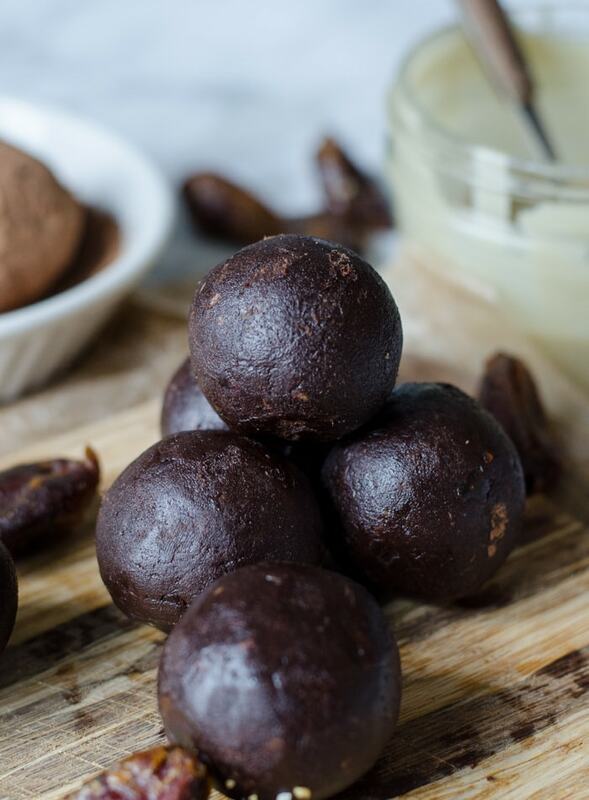 These delicious tahini cacao fudge balls require just 3 ingredients: dates, tahini and cacao. 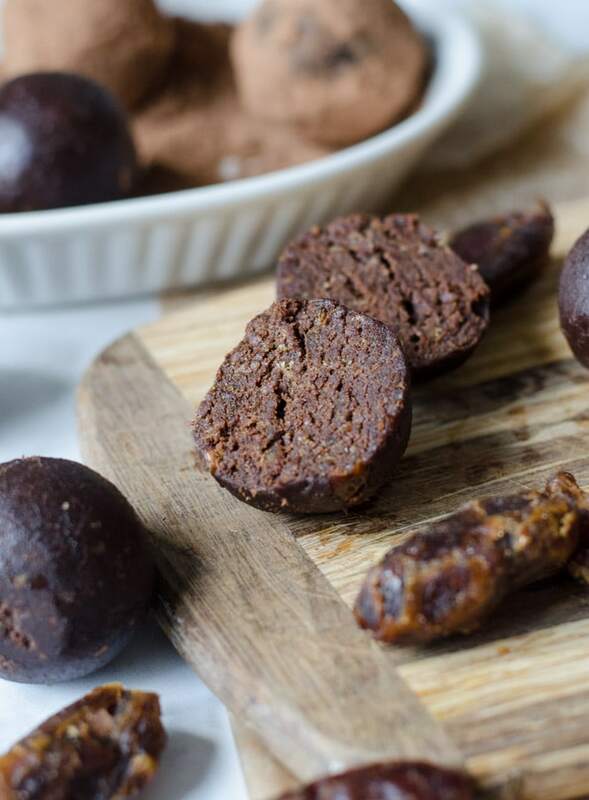 They’re vegan, gluten-free, grain-free, refined sugar-free and oil-free and taste absolutely amazing. They’re rich, decadent and fudgy but with those 3 wholesome ingredients you can enjoy them anytime. Add all ingredients to a food processor or high-speed blender and process until it forms a thick dough. Roll into about 15 balls and place in the fridge for a couple hours to set. Store in the fridge for up to 10 days or in the freezer for up to 3 months. I definitely never would have thought to use tahini. But I bet that’s what make these so delicious! Just made these & can’t stop eating them! Sooo good! Easy, quick, cheap & delish! It makes quite a lot so I only made half. Will be making some more for Christmas. Haha, I know, right? So good! Glad you enjoyed them! I wanted to use up the rest of my tahini. 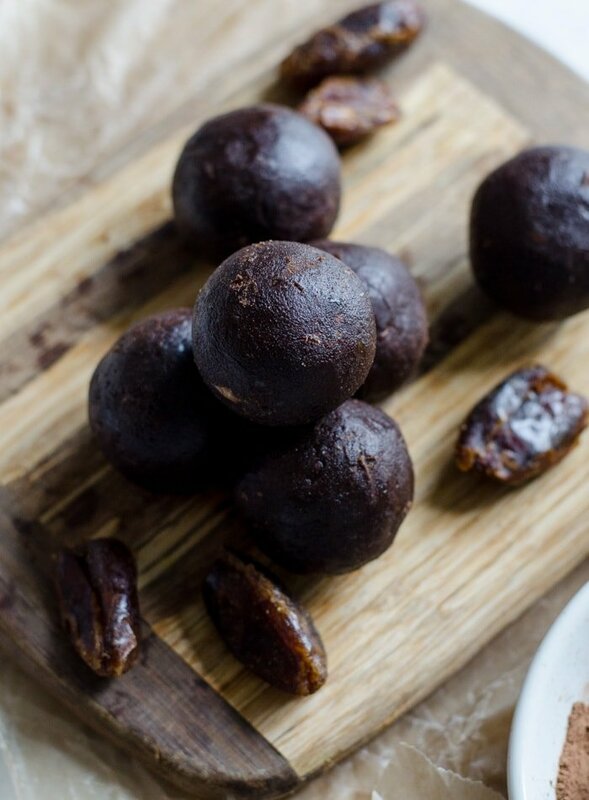 Have made date energy balls before but these are so good! I’m blown away at how fudgy they taste! Keep mine in the freezer. Yes, aren’t they amazing!! So good! I love them straight from freezer too. So glad you liked them! I haven’t tried this recipe yet, but I’m trying to eat a low-glycemic load diet and these seem like a perfect sweet treat. I’m not opposed to using tahini, but could I use almond or peanut butter for a different flavor profile? Yep, as long as it’s nice and drippy you can use any nut or seed butter. Enjoy!